Former president Bill Clinton speaks at the Auditorium Theatre on Thursday. He is touring the country promoting his new book, “The President Is Missing,” which he co-wrote with James Patterson. CHICAGO — Former president Bill Clinton said he remembers exactly one instance during his two terms in office when he successfully evaded his Secret Service detail. Clinton was attending a G8 summit, and he, alongside former Canadian Prime Minister Jean Chrétien, managed to ditch his detail and climb over a wall to have a private conversation. The whole incident lasted about four minutes, he said, and soon, they were back under the watchful eye of their handlers. “There is no incident I could think of where the president better serves his country by evading Secret Service protection,” Clinton said. Yet Clinton’s new novel, “The President Is Missing,” which he co-wrote with author James Patterson, hinges on exactly that scenario playing out successfully. Their fictional president, Jonathan Duncan, abandons his Secret Service detail and escapes the White House, effectively going rogue. 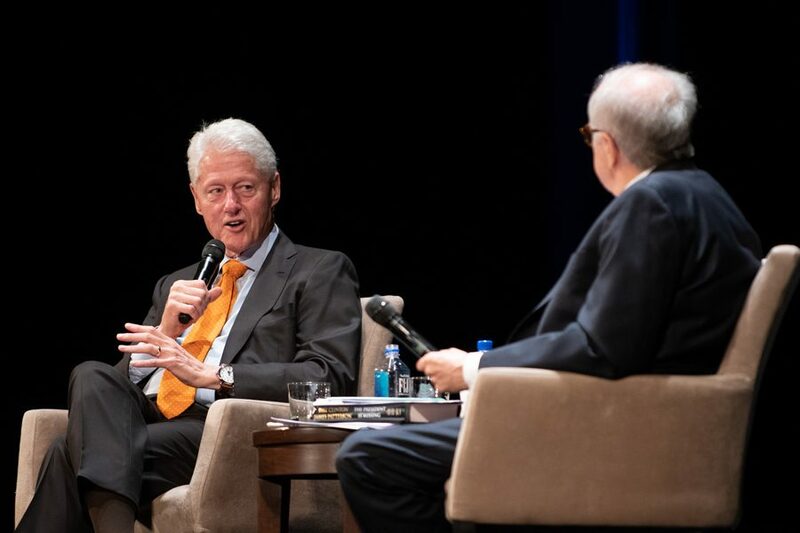 Speaking at the Auditorium Theatre of Roosevelt University, Clinton recalled the process of writing the book with Patterson and offered his take on current events, delving back into his experience as president. The conversation, moderated by longtime Clinton lawyer Bob Barnett, was attended by over 3000 people. Clinton stressed the “Catch-22” situation his fictional president faces in the book, where Duncan sees leaving his detail behind as the only viable solution to preventing the cyber threat. The theme of the book was meant to show readers the immediacy of cyber-related attacks, and their potentially devastating nature. Clinton said his worry about cyber attacks extends well beyond the 2016 presidential election — which was allegedly influenced by the Russian government and trolls — and that he sought to put the issue on the forefront of people’s minds. He said he wanted to ensure that people see the threat as a constant one. Clinton and Patterson’s book presents a worst-case scenario when it comes to cyber threats, but Clinton said he wants the book to act as a warning. He added that attacks like the one in the book can wipe out entire power grids, and serve as a real threat to the country. her 100 percent kill rate. Bach has a troubled background, influenced by the war in the Balkans, and Clinton said it was important to him that she is a complex character who readers can sympathize with, even as an assassin. He noted the importance of making informed choices as president, and that he constantly faced difficult decisions while in office. Clinton said he and Patterson put Duncan in similar situations over the course of the book, and wanted to convey the gravity of the office and the weight those decisions hold. Francisco Hernandez, a student from Chicago who attended the event, said he appreciated the former president’s message and hopes to carry it with him in the future. He stressed the importance of going to the polls, and supporting candidates who run on an affirmative agenda and stand for issues and policies, not just in opposition of President Donald Trump. He said voter suppression in midterm elections is especially high, as many don’t turn out at the polls. When Barnett addressed Trump’s recent immigration policies — including family separation at the border and the zero-tolerance policy from the Department of Homeland Security — Clinton was quick to condemn the administration’s choices.